Josh Nagel his his finger on the pulse of Baylor and Syracuse basketball. Baylor and Syracuse have a lot in common on the basketball court, and now they're facing each other in the first round of the 2019 NCAA Tournament. The No. 8-seed Orange and No. 9-seed Bears meet on Thursday night at 9:57 p.m. ET in a West Regional first-round game in Salt Lake City. 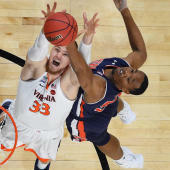 Both clubs might view their opponent as a mirror image -- they have won games with gritty defense and physicality, and both have overcome being short-handed to receive a March Madness invitation. The Orange are 1.5-point favorites, down half-a-point since the announcement that Syracuse point guard Frank Howard (suspension) is out, while the over-under for total points scored is 130.5 in the latest Syracuse vs. Baylor odds. Before you lock in any Syracuse vs. Baylor picks, read the 2019 March Madness predictions from SportsLine's Josh Nagel. A Nevada-based expert with more than 20 years of experience in the sports wagering industry, Nagel specializes in handicapping college athletics. He has had another standout season as SportsLine's top college basketball handicapper, hitting better than 60 percent of his point-spread picks for SportsLine members. Anyone who has followed his is way up. What's more, he has had a particularly keen eye for the tendencies of these two programs, posting a record of 15-3 on spread picks involving Baylor or Syracuse over the past two seasons. For example, he told SportsLine members in early February that Baylor (+2.5) was due for a letdown spot when it visited a hungry Texas team on short rest. The Longhorns ended Baylor's six-game win streak with a convincing 84-72 victory, and anyone who followed Nagel's advice booked an easy winner. Now, Nagel has locked in on Syracuse vs. Baylor. He's studied this matchup from every angle and released a confident point-spread selection that is only available at SportsLine. He knows both clubs are eager to capitalize on the opportunity to advance and face a likely matchup with top-seed Gonzaga. The Orange and Bears have a rugged approach that travels well in March when many players lose their shooting touch. The Orange have made the most of similar scenarios too. Three years ago, they were a 10-seed after losing five of their last six heading into the NCAA Tournament. Their defense stepped up and the offense came alive, and Syracuse ended up in the Final Four. Moreover, Syracuse has likely performed better than its recent results suggest. Four of the Orange's past five losses came against Duke, North Carolina and Virginia, all of which are No. 1 seeds in the 2019 NCAA bracket. And while the Orange will be without Howard, Buddy Boeheim, son of coach Jim Boeheim, played well in the ACC Tournament and should be able to handle many of Howard's minutes without the Orange dropping off much. Still, the Orange aren't assured of covering the Syracuse vs. Baylor spread against a Bears squad that has a history of proving doubters wrong. The Bears were picked to finish ninth or worse in the Big 12 by most outlets, but instead were in contention for the title most of the season before eventually finishing third. Baylor's prospects looked even gloomier when forward Tristan Clark was lost to a season-ending injury, but the Bears showed resolve. Role players made the most of their newfound minutes and Baylor increased its energy on defense, holding opponents to 67.3 points per game. The Bears swept high-powered Iowa State during the regular season, while also notching non-conference wins over Alabama and Pac-12 Tournament champion Oregon. Senior guard Makai Mason leads the way with 14.5 points per game. We can tell you Nagel is leaning under, but his stronger play is on the spread. He has scoured this matchup and unearthed the critical x-factor that makes one side of the spread a must-back. It's only available at SportsLine. Who wins Baylor vs. Syracuse? And what critical x-factor makes one side of the spread hit hard? Visit SportsLine now to find out which side of the Baylor vs. Syracuse spread you need to jump all over Thursday, from the senior analyst who's hitting 83 percent of his picks involving these teams.